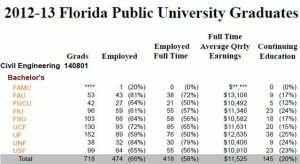 According to the data provided by the Florida Department of Education (http://www.fldoe.org/core/fileparse.php/7592/urlt/1213susbyprogram.pdf), our 2012-2013 graduates had the highest average quarterly salary and the second highest rate of job placement among the civil engineering programs in Florida public universities. This might be the reason why we have always received compliments from industry about the quality of FAU Civil Engineering graduates. 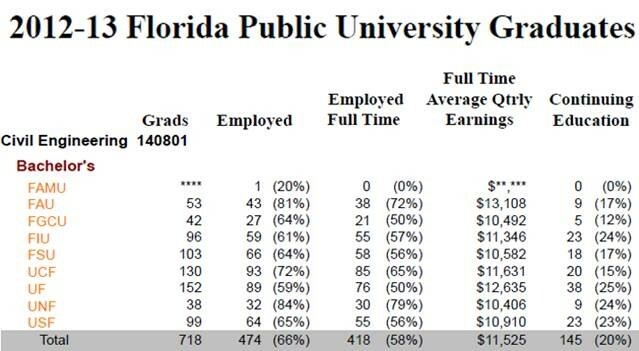 Our students receive first-class education and best service in Civil Engineering at FAU.